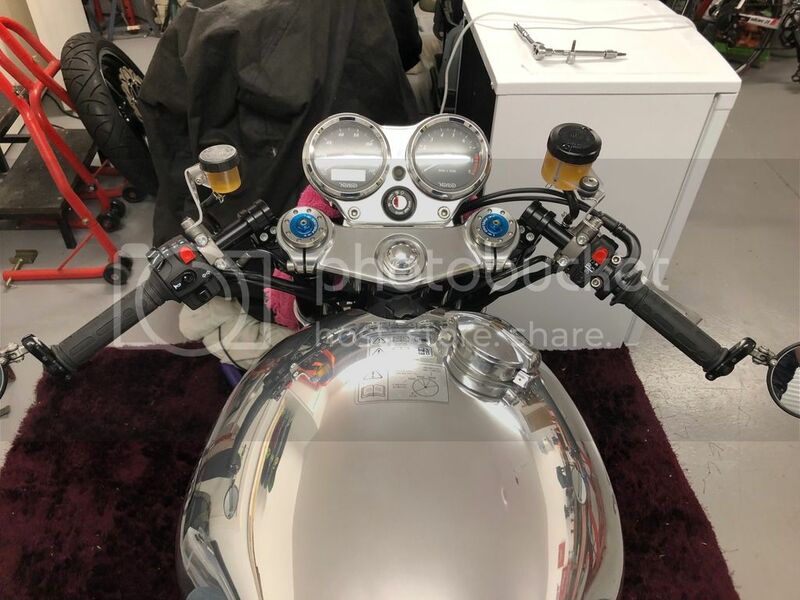 Discussion in 'Norton Motorcycles (Modern)' started by David Hales, Dec 2, 2018. Are you getting the 961 Sport Fat Bars ? You said flat bars . Will you need brake hoses ? Lets ask Fast Eddie he is doing this . And this a Domi a bit different hey ? Richard -7 also did this but I dont know if he needed longer brake/clutch lines . Oh I remember now , he went from SE to CR so he started with Sport bars I think. Yes, I’m going from clip ons to Sport bars on my 961CR. Needs new hoses and wiring IIRC. Being an ABS bike, I elected to ask the factory to do the work for me (bleeding can be frustrating at the best of times I find, never mind bleeding an ABS system). A new top yoke is really surprisingly expensive, so the factory offered to machine my CR top yoke to take bar mounts. On my ‘74 Cdo I used to swap between bars and clip ons and it could be done in minutes. There are a surprising amount of parts involved on the 961 and it’s not exactly what you’d call a quick or cheap job. Thanks for the feedback. And you will be more comfortable ! I collected my ape hanger Cafe Racer from the factory today (read: Sport bars equipped Cafe Racer). The boys did a great job (thanks Dave and Andy) and sorted a couple of niggles whilst it was there that I didn’t even know I had. It’s certainly MUCH more comfortable ! The Harley idea can go to the bottom of the list now, for the time being at least! Good , you should really be able to pile on the miles now. Here’s some pics of my ape hanger cafe racer. The riding position is SO much better! It’s like a different bike. Of course, it no longer has the lovely lithe appearance it did however. I’m not sure about the sticky-up-in-the-wind remote reservoirs though. Perhaps they’ll grow on me. 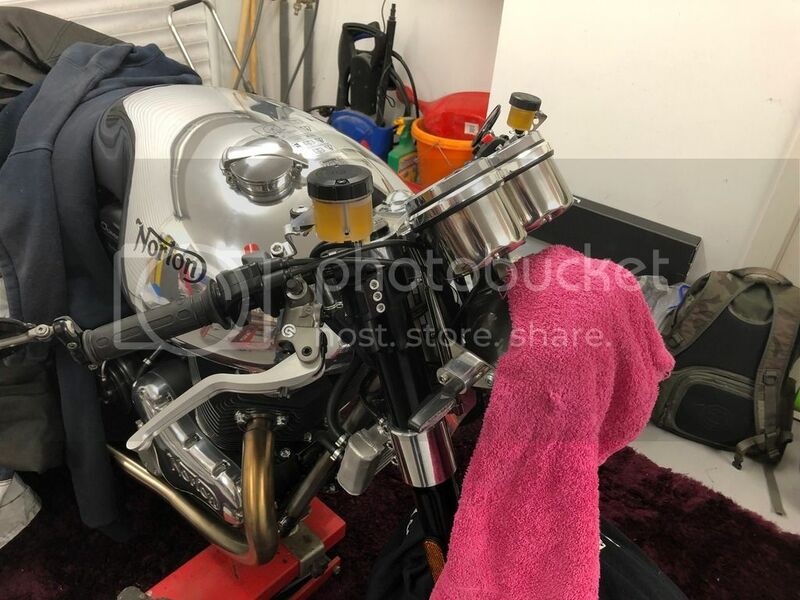 I may do the complete change sometime latter this year but will be a much bigger job, new billet top yoke as I don’t want to drill the original, risers, bars, new clutch and brake lines, new Throtle cables, wiring? Wiring didn’t need changing on mine, don’t know about a Dommie tho. OUCH thats quite a bit . I say drill the originals if it will save many hundreds . Also , The drilled holes can be plugged when not in use. This could be called the "convertible option" . On the glass have full side, the wind stream should keep the fluid cool. BritTwit, Clive, thesixthelephant and 1 other person like this. They look like the same ones I fitted to my R9T. They look nicer on your Domi tho !! Are they swan neck clip-ons for the R9T, or another brand? If they fit the Norton Olins I may try them on my CR. Just enough lift over the stock clip-ons to be comfortable, but not high enough to require longer wires for switches.